Word spread about this young girl putting together an important film, and in 60 days, Dallas had a volunteer professional crew of 30, 100 volunteer extras, celebrity cameo appearances, and $600,000 in donated resources. Shortly after, her 46 minute film, Just Yell Fire, premiered at her school, with local news stations picking up the story and it snowballed across the U.S. and Mexico. Dallas wanted as many girls as possible to be able to watch her film, so she put the film online for free download, and raised money to produce and ship free DVDs to girls without Internet access. Just Yell Fire is currently in 66 countries (including countries like Iran and Pakistan where girls’ rights are severely limited) and has over a million downloads. 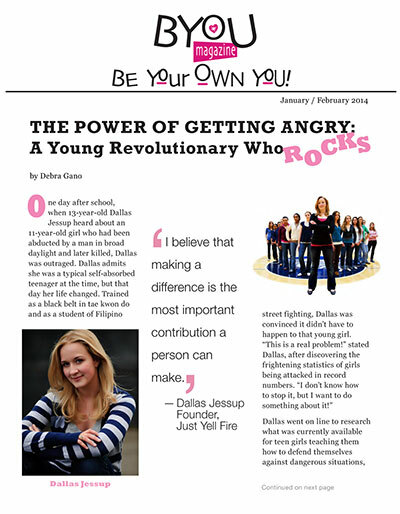 Over the years, Dallas has won numerous awards for her work as a Do-Gooder, including being nominated for a Teen Choice Award for the “Do Something” category. She’s appeared frequently on national television shows such as Good Morning America, CNN, and Today, and speaks around the country about self-defense and the importance of becoming a Do-Gooder. Her non-profit now provides teen-safety programs for schools, camps, and crisis shelters, and now, as a recent college graduate, Dallas is establishing training programs to train coaches in other states to equip girls with skills to get out of harmful situations. YOU have the power to start a revolution – a revolution where not only your life gets better, but hundreds or thousands or even millions of people improve the quality of their lives, too. You can be more than just a kid or a student or a jock or a nerd or a brain or a cheerleader or whatever label the world uses to describe you now. You can be more than that: you can be a Revolutionary! Revolutions aren’t always fought by large armies or entire nations. The most important revolutions start small, one person at a time. An idea, an observation, a thought, or even just a feeling can all give rise to the power of a revolution. Anybody can be the catalyst for a change in our society, even kids. We have the freedom, the power, the energy, the dreams, and the courage to start revolutions. All we need is a little push. Kids are taking on world hunger, speeding up the search for cures to horrible diseases, and standing up for the environment. We are doing what adults can’t, won’t, or just plain don’t. So there are thousands of kids changing the world – all different colors and shapes and sizes and zip codes. Most weren’t old enough to drive; they had never given a speech or held a public office; they weren’t the best students or the best athletes; they were just everyday, average kids. Kids like me, kids like you. But the thing they had in common was that they all saw a problem and decided to do something about it. Decide what makes you angry and do something about it. Every revolution starts with some kind of injustice. A feeling deep in your heart that you know something isn’t right and that you can’t just walk away and let it be. Your first step is to take action. Nothing gets done in this world without taking this first step. Fighting injustice takes commitment, so pick a battle you want to win, one you know will make your heart beat faster. You have to do what you love and you’ll do your best work. That is where your revolution should start. What do you love? Can you sew? You might start a non-profit that mends clothes so kids’ hand-me-downs don’t look so rundown. Can you sing or dance? You can throw karaoke or dance parties to raise funds for the charity of your choice. Make it personal, make it powerful, and, most of all, make it something you are passionate about. And when you do, people will jump in to help you do it! The movement feeds on itself. You help one person, they help one person, that person helps another person, and soon the whole community is helping each other, one act of kindness at a time. If you’ll join us, I think we’ll see a very different and far better world five years from now; a better world created by Revolutionaries like you and me.